The results of the current research show that benefits of OD can be driven through six separate mechanisms that can directly or indirectly provide benefits to society through social, economic and environmental means. The first provides social and environmental benefits through the mechanism of public service delivery, which enables citizens to stay informed and interact with their governments. The second provides economic benefits with the support of industries and commerce through the innovation and creation of products and services. Further economic advantages can be obtained by re-using knowledge and wisdom drawn from OD across internal government organizations, leading to efficiency gains and operational cost savings. Finally, the last three mechanisms have the potential to provide social, economic and environmental benefits with the support of academic research, evidence-based policy decisions, and public accountability. The findings of this research indicate three factors that can either help or hinder the effectiveness of OD: availability of data, standards, and dynamism. 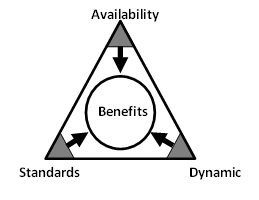 The following diagram illustrates how benefits can be obtained when governments make data readily available, that is dynamic, and that adheres to established standards. Data needs to be made available in an open format while rigorously protecting privacy. This includes data that can be extracted from PSI and that has not yet been made public. It can also include public data that has not yet been made available in a machine-readable format. The ability to publish data starts with effectively capturing and organizing PSI. For the most part, existing IM practices within the GC are not effective and not compliant with existing policy and directives. This makes the work of publishing OD even more complex for the civil servants managing the data. Salient obstacles to implementing IM practices identified in Library and Archive Canada’s (LAC) evaluation include lack of resourcing and lack of familiarity with policies. Nearly one third of participating departments and agencies felt that IM was simply not receiving sufficient attention and priority within their organization. Furthermore, only 20% believed that their organization was capable of managing information effectively. The GC’s approach to managing information has not proven to be effective across departments and agencies and these issues will impact their ability to make OD available. The role of government needs to include a mandate to manage data. Within their IM policy and directives, the GC has defined information of business value as an asset. These assets help to support and facilitate decision making, operations and the delivery of programs and services. Unfortunately, the link between IM policy and directives and the benefits of publishing OD is still missing. The GC is attempting to address this issue with the development and implementation of a Directive on Open Government, which should provide guidance to departments and agencies on how to identify information, and how to determine formats and standards for publishing Open Government Data. Other countries have taken different approaches to the same issue. President Barack Obama has released an executive order committing all federal government data to be open and machine-readable. The British Prime Minister has attempted to mitigate the issue with a public letter addressed to all senior civil servants. New policies and directives from the GC will help minimize challenges around effective management of information. But given other priorities, the lack of resources and understanding of policy, the GC still needs to mitigate the issue of compliance. Stronger action is needed to prevent issues with compliance or the publishing of datasets will suffer from cutbacks. In addition, GC departments and agencies need guidelines and tools to help them identify and manage OD. Furthermore, GC compliance with the access to information legislation has been in steady decline for the past several years. A special report to Parliament in 2010 revealed issues related to a lack of commitment from senior management within departments and agencies, mismanagement of time extensions, and an insufficient pool of resources and training devoted to access functions. With an increase in the volume of electronic records and a lack of sound IM practices, this will lead to additional costs and delays. OD has the potential to help the GC resolve issues surrounding access to information requests. Opportunities can be realized where requests for information, which would have normally gone through the lengthy process of a formal access to information request, can be accomplished with access to OD. Not all requests could be satisfied with OD, but the potential for operational savings could be significant. This would require collaboration among OD teams and people responsible for access to information requests. According to the current program of research, the most prominent users of OD are members of the research community. These individuals have the skills required for in-depth analysis and prefer data in its original state untouched and unfiltered. They are also users of macro data sources that help social causes that impact a larger portion of the population. The long-standing social benefits of research can be significant. Research outcomes have the potential to foster collaboration with the community and promote sharing of information and innovation. The GC needs to support academic research, foster further collaboration with the academic community, and promote sharing of information. The possible economic advantage that can be obtained from combining data is creating a demand and encouraging private companies and individuals to develop, implement and maintain mobile and web applications. This is especially true with micro data and mobile applications that provide a public service. These types of initiatives can provide the government with insight into the type of data citizens are interested in seeing. Currently, the development of applications is a relatively small outcome of OD. When asked if OD projects would create a profit for them or their company, only 16% of survey participants agreed, 34% said no and 27% did not know. Notwithstanding, when asked if they are likely to use OD in the future 84% said yes. Furthermore, 95% of survey participants believe that OD is important for the support of innovation. Making more data available openly will only increase the potential for such applications, as well as support industries and commerce which can in turn create further economic benefits. When governments provide data they have two options. They can publish the underlying data in a machine-readable format, such as OD, or they can provide access to the data through a visual and interactive user interface, such as web sites. Underlying data is considered adaptable and can easily be re-used and aggregated with other adaptable data. It is the preferred format for the skilled user who prefers to analyse unfiltered data. However, such data is useless to citizens with limited data analysis skills. Although web sites are useful to users with limited skills, they are considered inert data and cannot be easily re-used. In the absence of OD, inert data on public web sites creates dependence on scraping, which carries a number of ethical and economic concerns. The re-use of extracted data through scraping is occurring without proper license agreements. The GC OD license agreements do not take into account the re-use of extracted data from public web sites. With nearly 50% of surveyed participants scraping public web sites this is an issue that governments need to address. When inert data is published on public web sites, the motivation for departments and agencies to release the data in an adaptable format is considerably low since the task of filtering and protecting sensitive data has already been completed. Unfortunately, this added level of effort is not being accomplished, despite the true value of OD being found in the knowledge and wisdom that is extracted from combining datasets. To accomplish this, PSI needs to be made available in adaptable formats. It is the ability to aggregate machine-readable data that adds value to data. This is especially true when combining primary data from public sectors with secondary data sources from external sectors. Such combinations significantly increase the potential for further knowledge and wisdom. This is an advantage that cannot be achieved without technology and, although potentially disruptive for governments, it is beneficial to society. If OD is not available, citizens would be dependent on governments to render and display information and the knowledge and wisdom drawn from it. OD should be made more accessible in machine-readable formats so that everyone can benefit from its knowledge and wisdom. Inert data can pose a number of challenges as well. Government organizations struggle to meet an overwhelming amount of end-user requirements when they develop and deploy applications. Adherence to Common-Look and Feel (CLF) and language requirements drives the cost of developing applications and in many cases the public’s need for data is not met. There are also the costs and resources associated with the ongoing support and maintenance of systems; governments have a tendency of keeping systems online past their usefulness, which brings additional unnecessary costs that they will need to incur. The private sectors have already demonstrated how they can develop and implement applications faster and more efficiently. In addition, private parties will address the market need and meet their requirements if adaptable data is made available by governments. Because of this the GC should spend their limited resources publishing adaptable data instead of deploying applications. Inert data has its place; it is useful for users with limited skills to analyse data. In some cases, governments have a mandate to make information available in a visual interface for the public, including such users. Nevertheless, the GC should prioritize OD over inert data. Publishing OD will allow private companies to develop and deploy applications and in turn provide faster access for citizens. It has been established that combining data is an important beneficial process. It is necessary, then, to establish standards for OD. Available data allows us to access information and provides openness and transparency for governments but the need to aggregate OD is key to extracting its full potential. Standards can make this process easier for users of OD and in turn provide greater breadth and quality of information. Without standards to validate and identify data, GC departments and agencies will be reluctant to release OD. There are several existing initiatives within the GC that could help to establish standards for OD. For example, Natural Resource Canada has conducted extensive assessments for validating the dissemination of sensitive information. Decision trees with detailed step-by-step instructions have been developed and could be re-used to help develop OD assessment tools across multiple departments. A similar tool was developed and implemented in the province of British Columbia, where such tools are a requirement of their OD policy. Outside of Canada, the World Bank is using an innovative method to seek suggestions for the development of their Open Data Readiness Assessment Tool through crowdsourcing. The formalities involved in extracting data from several government departments can be unwieldy, preventing effective outcomes and innovations. The survey revealed how individuals obtained data from multiple sources, and how individuals are using data by aggregating OD. One important benefit of OD is the ability to aggregate it with other data; from which value, information and knowledge is derived. One of the challenges of aggregating data is the lack of using common standards. Standards determine how data is structured within the packaged dataset; when data sources use different standards, it can be difficult or even impossible to aggregate data. A researcher or a government department wishes to study respiratory illness in children between the ages of 0-5 years old. One objective is to create a geographical representation to determine areas of increased risk for respiratory issues using Canada’s geographic standard. The data required to complete this assessment would necessitate looking at several federal and provincial government sources. Respiratory illness data may reside with the respective governments of the 10 provinces and 3 territories or with the Canadian Institute for Health Information (CIHI) which is a federal cost recovery institution. In addition, a list of deaths caused by respiratory diseases can be acquired from Statistics Canada; this data is only aggregated into provinces and territories making it difficult to identify issues in urban areas or smaller, rural areas. Statistics Canada also produces population data by age. Depending on the type of geography, a custom request for information might be required; if so, this would lead to additional costs and processing time. Air quality data would need to be acquired from Environment Canada. This is point source data collected from air quality sensors. None of these datasets use the same standards for geography. If the analysis were to include income and country of origin to the mix, data from Canada Revenue Agency and Citizenship and Immigration Canada would be required, which would add new formats for geographies. The overall analysis is impeded by costs, time delays, multiple jurisdictions, multiple licenses and a lack of a geographic aggregation standard which reduces its benefits. Governments face certain challenges when attempting to publish OD; these are due to the new actors involved in OD and the flow that data takes on. OD has the potential to travel through a dynamic loop and return to its origin. The added value derived from OD initiatives comes from combining primary data sources with other data sources and connecting multiple providers and stakeholders. For example, health care data related to a specific illness that is combined with geographic locations could benefit a series of stakeholders including government, health care workers, researchers, not-for-profit organizations, and individual citizens. In addition, the data could also be enhanced while circulating through data sources and providers. This flow of information provides benefits and is what governments need to think about when publishing data. A government which is accountable is a more cost-effective, transparent, efficient and responsive government. The release of OD can account for transparency but this is only one step to obtaining accountability. Accountability needs information to cycle back to governments. After data reaches its intended audience, mechanisms need to be in place that allows stakeholders to react, and governments need to respond accordingly. These series of events are required to achieve the full benefits of public accountability. The lean approach used by entrepreneurship could benefit government operations. A major reason for entrepreneurship success with OD relates to the speed with which they can deploy solutions. In most cases, these are interdisciplinary teams that develop the simplest solutions and go to market to learn from actual experiences and feedback. OD contests that are hosted by different governments are a good example of how fast the private sector can deploy applications. The city of Ottawa’s last contest received more than 60 applications within weeks as opposed to months. This rapid and iterative approach to developing solutions could benefit governments when it comes to publishing OD. In most cases, the traditional approach to government development is cumbersome and time consuming. With the release of OD, governments will need to make changes within internal processes to allow for dynamic data. GC departments and agencies could benefit from interdisciplinary teams to deal with OD initiatives. Change is much more than the analytical side of a business case. There needs to be a broader approach to change that includes what people think and how they feel. Lewin conceived the three stages of a transition process as unfreeze, change and refreeze. It is in the unfreeze stage where planned changes are likely to fail because of resistance. The major reasons are linked to a lack of strategic direction, clear vision, communication and the failure to create a sense of urgency. If a sense of urgency and/or importance regarding OD is not understood then motivation for change within public organizations will remain low and plans to release OD will progress slowly or not at all. President Obama has understood this; by releasing an executive order committing all federal government data to be open and machine-readable, he is fostering an environment of urgency and importance that is needed for systematic change. Furthermore, to minimize complacency the US government hired a new Chief Technology Officer (CTO) from the private sector with OD experience. An individual that was not previously in government can bring innovative perspectives and ideas to the government system and underscore the environment of urgency. This sense of urgency from senior officials is required to help people transition from the old to the new. People have a tendency to revert to familiar routines and systems, particularly if anxiety about the change sets in. Persuading people to leave their comfort zone requires ongoing effort and dedicated leadership. Managers can sometimes become impatient, overestimate the success of the change, and stop creating a sense of urgency. Failure to communicate a clear vision and a strategic direction will prevent governments from sustaining a sense of urgency and inadvertently encourage employees to go back to their old ways. Additional resistance from organizational culture can include an episodic process of change. Public scrutiny, advocacy and special interest groups trigger the disruptive nature surrounding OD; this external environment is shifting and precipitating internal pressures, which move organizations away from their equilibrium. Triggered by external environments, internal performance and new strategic directions, an episodic change is created and will prove to be more disruptive and slower to implement with less chance of success. Resistance should be minimized however possible, as it can clash with the strategic direction of OD initiatives. Deeply embedded organizational culture can prevent the success of planned change. Trying to change culture is like changing the belief of individuals because behaviors that are driven from organizational culture are embedded in members’ values. These values inform cultural actions and behaviors. Motivating and utilizing behaviors are the only way to prosper from organizational culture. Aligning the organization’s objectives with its culture will help focus the strategic direction; such an alignment can accelerate organizational change. If management ignores the organizational culture of government, they will risk losing positive attitudes and behaviors that can make OD a success. In addition, a critical success factor will be selecting key individuals that can propel change and lean operations. Formative Evaluation of LAC Strategic Outcome 1.0. Directive on Recordkeeping, Government of Canada, Last modified July 18, 2011, http://www.tbs-sct.gc.ca/pol/doc-eng.aspx?id=16552. Canada’s Action Plan on Open Government. Government of Canada, Last modified April 11, 2013, http://open.gc.ca/open-ouvert/ap-pa04-eng.asp#toc6. Letter on open government for the President of the Treasury Board, Office of the Information Commissioner of Canada, Last modified January 19, 2012, http://www.oic-ci.gc.ca/eng/rr-sl-odi-adi_2012_1.aspx. Letter on open government for the President of the Treasury Board. Eaves, Calculating the Value of Canada’s Open Data Portal. Best practices for sharing sensitive environmental geospatial data, Natural Resources Canada, Last modified February 12, 2012, http://geoscan.ess.nrcan.gc.ca/starweb/geoscan/servlet.starweb?path=geoscan/geoscanfastlink_e.web&search1=R=288863. Open Information and Open Data Policy, DataBC, Last modified April 12, 2013, http://www.cio.gov.bc.ca/local/cio/kis/pdfs/open_data.pdf. Readiness Assessment Tool, The World Bank, Last modified April 12, 2013, http://data.worldbank.org/about/open-government-data-toolkit/readiness-assessment-tool. Geospatial Standards and Operational Policies, Natural Resources Canada, Last modified April 12, 2012, http://geoconnections.nrcan.gc.ca/1017. Helbig et al. “The Dynamics of Opening Government Data,” 21. Peixoto, “The Uncertain Relationship between Open Data and Accountability,’” 203. Ottawa Open Data App Contest, City of Ottawa, Last modified May 13, 2013, http:// http://www.apps4ottawa.ca/. John P. Kotter, “Developing a Change-Friendly Culture: an interview with John P. Kotter.” Leader to Leader 48 (2008): 35. http://onlinelibrary.wiley.com.ezproxy.royalroads.ca/doi/10.1002/ltl.278/pdf. Kotter, “Developing a Change-Friendly Culture,” 35. John J. Lucey, “Why is the Failure Rate for Organisation Change so High?” Management Services 52, no. 4 (2008): 14. https://ezproxy.royalroads.ca/login?url=http://search.proquest.com/docview/234257649?accountid=8056. Executive Order — Making Open and Machine Readable the New Default for Government Information, The White House. Last modified May 9, 2013, http://www.whitehouse.gov/the-press-office/2013/05/09/executive-order-making-open-and-machine-readable-new-default-government-. Chip Heath, “Making the Emotional Case for Change.” McKinsey Quarterly no. 2 (06, 2010): 88. https://ezproxy.royalroads.ca/login?url=http://search.ebscohost.com.ezproxy.royalroads.ca/login.aspx?direct=true&db=buh&AN=49469781&site=ehost-live. John P. Kotter, “Developing a Change-Friendly Culture: an interview with John P. Kotter.” 35. Psychology 50, no. 1 (02, 1999): 7. https://ezproxy.royalroads.ca/login?url=http://search.ebscohost.com.ezproxy.royalroads.ca/login.aspx?direct=true&db=buh&AN=1776889&site=ehost-live. Weick, “Organizational Change and Development,” 11. Jon Katzenbach and Ashley Harshak, “Stop Blaming Your Culture,” Strategy+Business 62 (2011): 1-10. http://www.strategy-business.com/media/file/sb62_11108.pdf. Katzenbach, ” Stop Blaming Your Culture,” 113.